This is such a cute book! It’s called A Lark in the Ark by Peter Bently. This book has those peek-a-boo flaps ~ my son’s favorite! 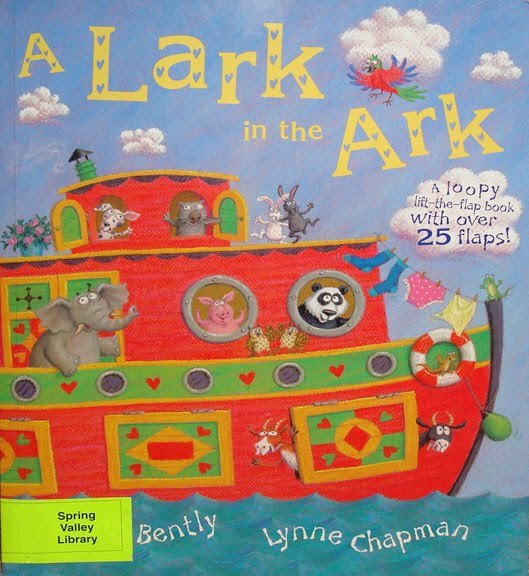 It’s raining on the ark so all the animals decide that it would be fun to play hide and seek with Noah. He ends up finding all the animals in his bedroom. He finds apes in capes, doves in gloves, dogs in clogs, seals in high heels, bats in hats, pigs in wigs, owls in towels, and so on. Absolutely adorable! After he finishes finding all the animals, the sun is back out and they have a party on the deck. For more Book Fan Friday posts, head over to Three A’s and a C.
Oh my goodness that sounds so cute!! I love it! Thank you so much for sharing.